Eye: Sweet spices, muscat grapes, evolving into elegant notes of wood. Long, warm finish. The La Guilde Saint Germain de Vibrac Petite Champagne 2007 Cognac is a delicious oppportunity to discover the terroir that sometimes gets overlooked in favor of its Grande Champagne big brother. This, however, is a big mistake - because the two together are not known as 'Fine Champagne' for nothing. The village of Saint Germain de Vibrac is located within the wooded hillsides of Petite Champagne. The soils are limestone, and this has an amazing effect on the flavors of the grapes grown here. This vintage year of 2007 boasted a summer that was turbulent, not to mention challenging, for the Cognac farmers. But the eaux-de-vie that came out of this harvest was truly unique, and of a superb quality. This Cognac is real proof of this fact, and it's certainly one that provides both a wonderful taste experience, as well as being a topic of conversation. A great addition to any Cognac collection. 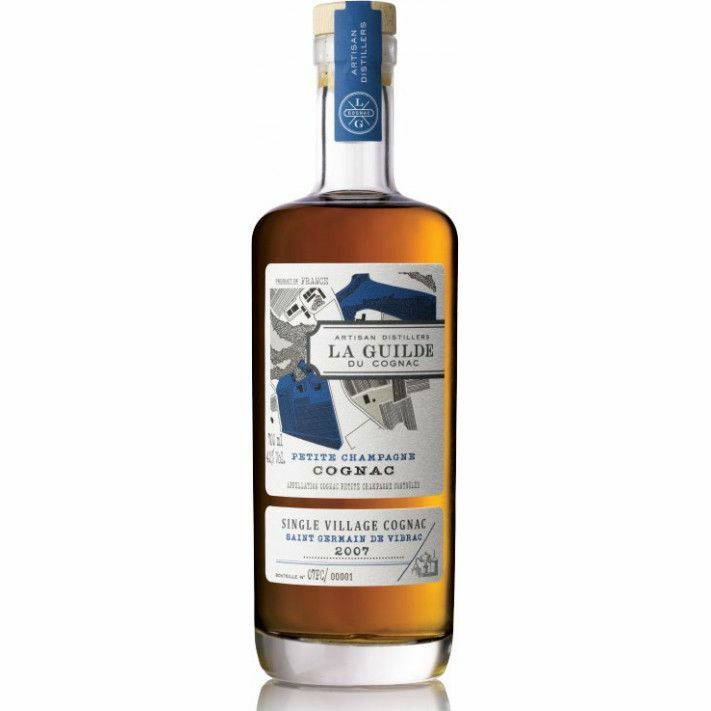 La Guilde du Cognac is not so much a Cognac house, rather it’s a way to bring a range of products to market that’ve been created by small, artisan producers of the region. It’s the creation of Maison Villevert, a house that boasts a history that can be traced back as far as 1487. The concept is about bringing the expertise of some of the most talented small producers to the notice of a larger global population: a population of Cognac connoiseurs who understand and cherish true quality when they taste it. Eye : Bright, straw yellow Nose : Aromas of summer fruits, peach, fig, apricot, as well as hints of lime peel, and green tea. Palate : Flavors of buttered honey, citrus fruits, and apricots. Finish is lengthy, fresh, and bright. Tasting review by Bache Gabrielsen: Nose : Wonderfully rich in fresh fruit notes, with touches of oak furniture and new leather. Palate : Continued grape, apple and mandarin juiciness. Herbaceous at points. Finish: Cinnamon, clove, and lasting sweetness of yellow plum.